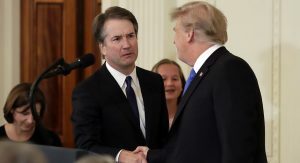 WASHINGTON (AP) — President Donald Trump chose Brett Kavanaugh, a solidly conservative, politically connected judge, for the Supreme Court Monday night, setting up a ferocious confirmation battle with Democrats as he seeks to shift the nation’s highest court ever further to the right. A favorite of the Republican legal establishment in Washington, Kavanaugh, 53, is a former law clerk for retiring Justice Anthony Kennedy. Like Trump’s first nominee last year, Justice Neil Gorsuch, Kavanaugh would be a young addition who could help remake the court for decades to come with rulings that could restrict abortion, expand gun rights and roll back key parts of Obamacare.